I grew up in the Midwest in the ’60s eating various and assorted “loose-meat” sandwiches, mainly Maid-Rite Sandwiches or as they are sometimes called Tavern Burgers. I never heard the word, Sloppy Joe, until I was an adult and moved away, and then no-one seemed to know what a Maid-Rite was! This is the old family, Church Cookbook recipe for the Maid-Rite made with Campbell’s Chicken Gumbo Soup. If you’ve never encountered the Maid-Rite Sandwiches, they are seasoned ground beef served on a soft, white bun (preferably steamed.) It is a lot like a Sloppy Joe but doesn’t have that sweet tomato sauce that Sloppy Joes have. This is the Maid-Rite Sandwich I grew up on, the one my Mom made. When I left home, I made them, too, and my kids grew up on these Maid-Rites. The name comes from the Maid-Rite franchise chain, although the recipe for this home-made version is quite a bit different than the original franchise version, which only has a blend of secret spices and no tomato at all. And no Gumbo Soup, either. Maid-Rite Sandwiches are just good basic family fare (but you could always add a little hot sauce) and this makes enough to feed a crowd & any leftovers, if you have them are even better the next day. It’s a perfect meal to make any time you have a busy night and If you have a smaller family, maybe you’ll want to stash some in the freezer. I’m giving you two recipes for Maid-Right Sandwiches, here. One is the traditional stove-top version and the other an Instant Pot recipe. Both are easy, but what the instant pot buys here is a little time saving and a long-simmered taste with no stirring or watching. I love the ability to set it and forget it and walk away until it’s done with no worries about stirring or scorching. By the way, if you don’t want to make so much on the stovetop, just half everything in the recipe. I never make a lesser amount because it’s so easy to freeze if I have extra and I love having a couple quick meals available at a moment’s notice. If you’re cooking in the Instant Pot, you won’t want to half the recipe because you’ll need the volume of liquid to produce the steam. While I almost always serve my Maid-Rite Sandwiches on buns, the cheap, soft, squishy kind, just like we had when I was a kid, the Maid-Rite Sandwiches filling is great as a stuffing for a baked potato, zucchini boat, or in Stuffed Peppers. I usually serve my Maid-Rite Sandwiches with sweet corn and fries, like my Stupid Simple French Fries or potato wedges, like my Bomb Baked Potato Wedges. Today, we served them with baby potatoes just because I had them on hand. As far as price savings, it’s the everyday items that really add up, more so than the occasional specialty item. We always tend to shop well if we’re buying something that costs a lot, and we tend to discount how much paying just a little bit more than we should, every week on the everyday items we buy often. If your family uses two pounds of ground beef a week, over a year you’ll see savings by stocking up and freezing when it’s at a rock bottom low, and you’ll usually see a low like that around once a quarter. 2 pounds x 52 weeks x $1.89 sales price = $196.56. At $2.49 a pound, it’s $258.96. At $4.49 a pound, it’s $466.96. That’s potentially about a 270 dollar difference in just one grocery item, and the only thing needed to attain that savings is to buy your ground beef at the right time. Just a little food for thought. Preheat the instant pot using the Saute function. Add the ground beef & onion & cook until the beef is no longer pink, using a wooden spoon or potato masher to break down the ground beef. Remove the instant pot liner and drain excess fat, if desired, and return the pot & ground beef mixture to the Instant Pot. Add the remaining ingredients, except the buns. Add the lid and seal and set to high pressure, seven minutes. When time is up, use the quick release. The beef mixture will still have quite a bit of liquid in it. Press the clear button, then the saute button and simmer, stirring now and then, until reduced to the point that when a spoon is run across the bottom of the pan, the space doesn’t fill in immediately with liquid. Taste and adjust seasonings. Serve on buns with desired accompaniments. Add ground beef and onion to a large high-sided pan or Dutch oven. Cook over medium-high heat until beef is no longer pink, using a using a wooden spoon or potato masher to break down. Drain excess fat, if desired, and return the pan to the stove-top. Add the remaining ingredients, except buns; bring to a boil. Reduce heat and simmer, uncovered, stirring now and then, for 10 to 15 minutes, or until mixture reaches desired thickness. Simmer to the point that when a spoon is run across the bottom of the pan, the trail doesn’t fill in immediately with liquid. Taste and adjust seasonings. I’ll be posting Maid-Right Sandwiches on Fiesta Friday #189; Fiesta Friday is an ongoing “link” party where bloggers join together and share their best recipes and party ideas of the week. This entry was posted in Click here for Bargain Meals, Click here for Fabulous Food Posts and tagged Canned Soup, Freezes Well, Ground Beef, Gumbo Soup, Instant Pot, maid-rite, Sandwiches, Sloppy Joes. Bookmark the permalink. Looks like a LOT of the local Target stores here (in North Texas) carry the soup! I am excited to try this recipe, thank you for posting! I would like to know where you still find Campbell’s Chicken Gumbo Soup. 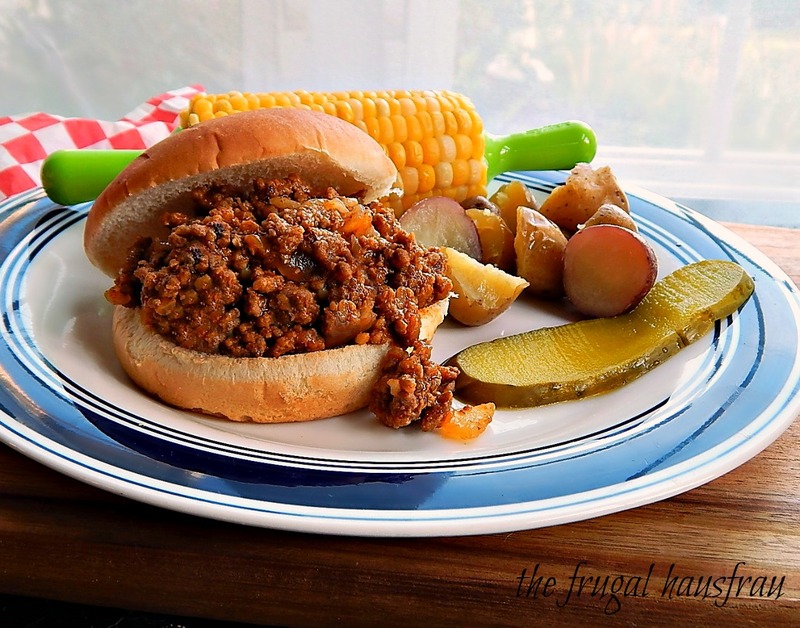 Years ago I used to make sloppy joes real often from a recipe in my Betty Crocker cook book. It called for the same soup. But I haven’t found any for years. Looking it up, there are a lot of people that can’t find it. Walmart has a sausage gumbo that is similar, but not close enough. I was in South Dakota and didn’t have an issue, but it sounds like this soup might be going by the wayside! I checked walmart online and they said “out of stock!” I hope it isn’t being discontinued because I don’t think there would be an easy substitution! I might have to see if I can find it now that I’m back in Minnesota and think about what a good sub for it might be. The flavor is so distinctive. California hasn’t had any for years as far as I remember. A couple of years ago on a Google search there were a lot of people who were also looking for it. That’s where I heard about the sausage gumbo that Walmart had. Tried it after taking out the slices of sausage. Not really close to the Campbell’s. Very disappointed! Me too!! Now I’m wondering how old that can I got in that small South Dakota town was!!! Thanks so much! It’s a favorite and to make in the Instant Pot is so much fun – so fast and tastes like it simmered half the day! P.S. Great hometown photo– how fun to grow up with a lake nearby!! It was fun to see it – we’re all about the lakes in our family! I live across the road from one in mpls. with a beach down the block, although my dogs always swim in it more than me. My son is a pretty strong swimmer and has swam across it several times. It’s not real large, but all the same it worried me. I wish I would have been around when you came through on the way to Wisconsin (or at least I had assumed you did, maybe not!) but Minnesota is a magical place. It has to be to put up with the winters, lol! I know these aren’t the traditional restaurant version, that’s for sure – I’ve been to the original Maid-Rite and it is just as you describe. Meat and maybe a few spices. How cool that you have one still in your town, Carlee!! The last Maid Rite I had was on a trip through Iowa on my way to pick up Chance when he was a puppy. It was hard to decide whether to get a Maid-Rite or an Iowa Pork Tenderloin sandwich – which some people call a Breaded Pork Tenderloin. The simple answer would have been have both, lol, I just couldn’t do it! Too full!! We also had a small place when I was growing up called Joe’s (my neighbor) who made the best “Joe Burgers” which were loose-meat sandwiches in the line of the real Maid-Rites. These aren’t as tomatoey as they look, but this old Gumbo soup recipe has been around at least since the early 60’s – it was a staple when I was growing up. I don’t think I ever used a recipe before I wrote this one down! Used to make these all the time but am not sure where you can get chicken gumbo soup anymore! Anyway, they are delicious and a nice change from sloppy joes. Hi Kay. My parents live in a smaller town and I had to pick it up on a drive to Sioux Falls! I just couldn’t imagine I’d not see it at the grocery store, here. I was a little Gobsmacked! I haven’t made maid-rites like this for ages and ages and that familiar taste just brought me right back to childhood. I’m guessing that maybe this was a back of the can or a Campbell’s cookbook recipe originally? At our house, too. I think it was probably a once a week rotation! What’s not to love!! ? What a perfect topper and a great idea! !